Jacques Demy's swooning, brightly colored ode to the bittersweet pain of young love is just as potent, honest, and relatable as it was 53 years ago. 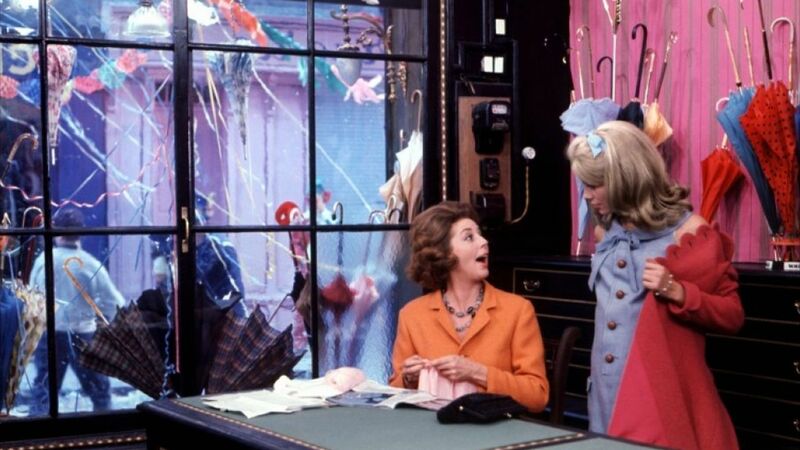 Often dismissed as being lightweight (a criticism also lobbed at its recent spiritual successor, La La Land), in reality, The Umbrellas of Cherbourg is anything but. It somehow manages to be both sad and joyful at once, a celebration of first love and a sobering dose of reality to counter the starry-eyed fawning that comes with it. The film made Catherine Deneuve an international star, and it's not difficult to see why. She luminous in this, a bright, wide-eyed young woman who matures over the course of an hour and a half. We can almost see her grow before our very eyes. As Geneviève, the teenage daughter of an umbrella shop owner who falls for Guy (Nino Castelnuovo), a young mechanic with few prospects, she practically embodies innocence and naivete. But when their whirlwind romance is interrupted by a military draft, and the requisite promises to wait and write every day, her journey to adulthood begins. The letters, of course, become less frequent, and new suitors begin arriving on her doorstep. Pregnant with Guy's child, and hounded by her well-meaning mother's insistence that she seek financial security, Geneviève is forced to make difficult choices that will determine the course of both of their lives. When Guy returns from the war and discovers that Geneviève has moved on without him, he finds new love in the most unexpected of places. Demy paints a picture of a young couple in love, torn apart by circumstance, before eventually drifting apart and finding other people to settle down with and start a family. The fires of passion eventually give way to the comfort of the safe and familiar. And yet, Demy never judges his characters or suggests that they are settling. They are merely growing up, growing apart, creating new lives of which the other cannot be a part. It's a beautifully sad, yet strangely uplifting and hopeful romance, one that has no illusions about the realities of young love, but treats it with dignity anyway. 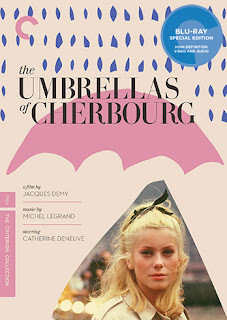 The influence of The Umbrellas of Cherbourg continues to be felt, from the films of Wes Anderson to the aforementioned La La Land, to even films like Lars Von Trier's Dancer in the Dark. Demy's use of color is almost revolutionary (not to mention the fact that every line of dialogue is sung, like an intimately scaled opera) - blossoming with the young lovers, before fading into more muted shades after they grow apart and start families of their own. Beneath its colorful exterior (gorgeously rendered through Criterion's stunning Blu-Ray transfer), there's something painful and almost raw about its emotional frankness. Yet Demy's outlook is never anything less than hopeful, embracing the romantic delirium of first love, while honoring the beauty and the strength of second love. The Umbrellas of Cherbourg may revel in its own artifice, but it is through that cinematic fakery that it captures the spirit of young love - filled with passion and fire, but never quite grounded in reality. Demy sends his two lovers soaring before bringing them back to earth, and the effect is at once wise, rapturous, and heartrending. It's pure perfection. Now available on Blu-Ray and DVD from The Criteron Collection.